Subtitled, "Europe Between Hitler & Stalin". 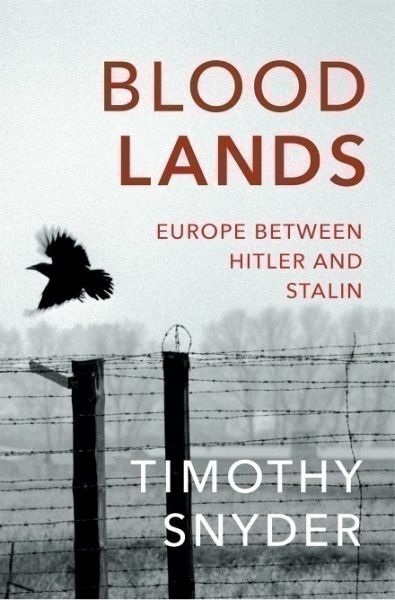 Looks at how, between them, Hitler and Stalin murdered 14 million people in the 'bloodlands' between Berlin and Moscow. This area is now Ukraine, Belarus, Poland and Western Russia. A brilliantly researched and profoundly humane book about the greatest tragedy in European history. 'When Timothy Snyder's book Bloodlands: Europe Between Hitler and Stalin was published in 2010, it quickly established its author as one of the leading historians of his generation, a scholar who combined formidable linguistic skills - he reads or speaks 11 languages - with an elegant literary style, white-hot moral passion and a willingness to start arguments about some of the most fraught questions of the recent past.' New York Times Timothy Snyder is Levin Professor of History at Yale University, and has written and edited a number of critically acclaimed and prize-winning books about twentieth-century European history: Bloodlands won the Hannah Arendt Prize, the Leipzig Book Prize for European Understanding, the Ralph Waldo Emerson Award in the Humanities and the literature award of the American Academy of Arts and Letters. Black Earth was longlisted for the Samuel Johnson Prize. Snyder is a frequent contributor to the New York Review of Books and the Times Literary Supplement. He is a member of the Committee on Conscience of the United States Holocaust Memorial Museum, a permanent fellow of the Institute for Human Sciences, and sits on the advisory council of the Yivo Institute for Jewish Research. "A hugely important historian of this nightmarish era. Nobody has explained it this way before"